← We’re getting close to the pointy end! This Saturday – it’s Book Launch time! Okay, so we’ve made it… almost! My first ever eBook launch is happening this Saturday for, you guessed it, Bonnie’s Story: A Blonde’s Guide to Mathematics. Now, using some artistically borrowed Google maps, I hope to get you all there. Finding 187 Rundle Street is really not that hard. What is even easier is there is a huge parking complex right next door, if you need a place to park. To get to that complex through the road closures for Clipsal and everything…. Well, as I don’t know where you’re all coming from, all I can suggest is get onto Frome, heading towards North Terrace, and then turn left onto Rundle Street and you should find it easily enough. There are two ways into the Writing Centre. There is a door to the stairs from Rundle Street as well as the lifts at the back. You can either get to the lifts from York Street entrance (which is easy to get to through the car parking complex). Or, as a tease to your taste buds, you go come through Cafe Brunelli’s on Rundle Street to a passage way at the back. You’ll then need to go through a door on the left marked ‘Disabled toilets and lift to upper levels’ or something like that and then you’ll find the old lift. Yeah, now isn’t that as clear as mud? Well, to try and stop your eyes glazing over at it all, here are those pictures! The first one is an overview shot of the whole situation. The lovely labels, also provided by Google Maps, pretty much explain it all. As you can tell from the lovely little A, that’s where the Writer’s Centre is. 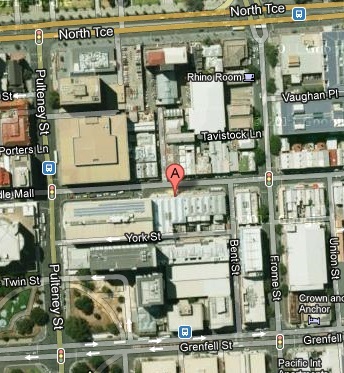 Rundle Street is the street the A is pretty much sitting on, York Street below it. Okay, so does the zoomed in picture help much? 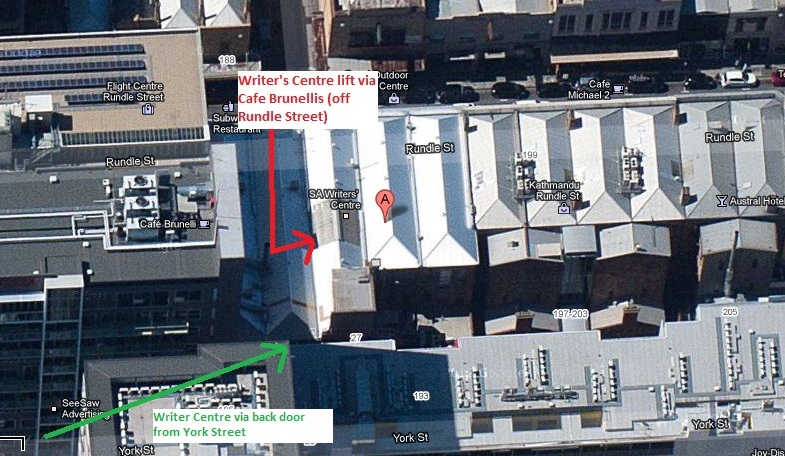 The red writing (which originally didn’t look so blurry) says “Writer’s Centre lift via Cafe Brunelli (off Rundle Street)” while the green writing says “Writer’s Centre life from York Street)”. I hope I’m not sounding much like a bossy, fretting mother, I just want to ensure you all get there okay. With all the other fantastic things happening in Adelaide on Saturday night, you may get easily distracted and wander off on me. So, shall we discuss the actual launch too? As it’s my first launch I really don’t know if I’ll be doing it right. And please don’t take the times as precise and exact, as I am not that pedantic, honest. Basically, the doors open at 6:30pm and that’ll be mingling time for you all to check out the gorgeous atrium, grab a drink and some nibbles and say hi. After that, as this launch is for an eBook not officially released until June, I sadly won’t have anything to sell you on the spot. However, if you feel like it, I am more than happy to sign either flyers for the launch, or the Bonnie Business cards. Okay, so I think I’ve nagged your ears off enough about this launch. The only thing left for me to do is to remember to turn up, not stress out and have a good time.